Bio: New Yorker Lucille Cole Carter worked initially as a successful fashion and furniture illustrator before dedicating herself to fine art. As a result she is recognized regionally and nationally in the United States for her vivid oil, pastel and acrylic paintings. Lucille is an associate member of Oil Painters of America and the Portrait Society of America. She is an award-winning, signature member of Associated Creative Artists, a signature member of the Pastel Society of the Southwest, and a signature member of the Pastel Society of America. Her work is included in many important collections in the United States, Canada and Mexico. She is represented by The Artists' Showplace Gallery in Dallas, Texas, of which she is a partner, Carson Art, Dallas, and Art Encounter, Las Vegas, Nevada. Lucille lives and has her studio in Dallas. Lucille clearly has a sense of humour: "I paint because I am a “control freak”! No, seriously… What else is there in our lives that provides greater freedom to create our own reality and share that reality with others?" Gallery: Landscapes ; Still Life and Florals; Figures and Portraits. Image View: Each gallery opens to thumbnails that are labelled with medium and dimension. Click to view chosen image. Click again to enlarge. Download is possible. 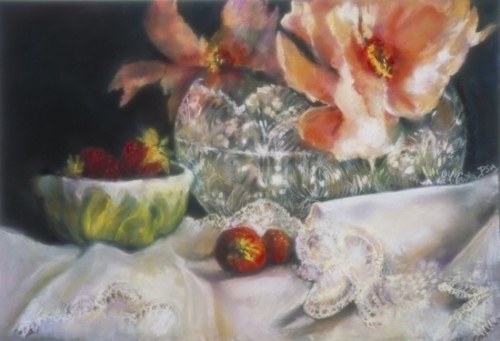 Strawberries, Crystal and Peonies is 18 x 27 ins, 500 x 341, 112 KB.